28 Amphibious Engineer Regiment, nicknamed “The Rubber Ducks”, operate under the command of 1(BR) Corps, to provide rapid bridging across rivers and canals, for all 1(BR) Corps units within the Corps area. 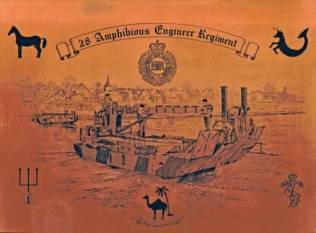 28 Amphibious Engineer Regiment was formed in April 1970 at Bindon Barracks, Hameln, West Germany, on the river Weser, based on 23 Amphibious Engineer Squadron. 64 Amphibious Engineer Squadron was formed in August of the same year to become part of the regiment. In January of 1971, 73 Amphibious Engineer Squadron was formed and became the third squadron of the regiment. In June 1976, 73 Amphibious Engineer Squadron became 73 Independent Field Squadron and moved to Osnabruck under the command 5 Field Force. In Mar 1979 HQ Squadron was formed, but in April of the same year HQ Squadron became 71 Amphibious Engineer Support Squadron (HQ and Training). This remained the organisational structure of the regiment until 1991. 28 has the most complex organisational structure within the Royal Engineers (fig 1), and has the largest base workshops, set up by the REME, to maintain the regiments’ equipment, throughout the entire British Army. The M2, (later the M3) bridging and ferrying system, a West German system based on floating wheeled vehicles developed in the 1960’s, gives the regiment its amphibious capability. The M2 is basically a large wheeled vehicle that can float and propel itself in water. Using a system of ramps and flat decks, numbers of M2 units, (rigs), can be coupled together to form “instant” bridges and ferries. This form of rapid bridging will be of prime importance in time of war, as bridges will be among the first communication points destroyed by enemy action, and will be required to facilitate counter offensives. The importance of rapid bridging is made clear by the fact that a single 1(BR) Corps armoured brigade has approximately 1,000 vehicles. Using the M2 bridging system, approximately 120 vehicles per hour can cross most of the water obstacles within the 1(BR) Corps area, so using two M2 systems it would still take between four and six hours for a complete armoured brigade to move across. Obviously the more rapid bridges used, the faster the brigade can cross. In an e mergency the Weser would be at the centre of 28’s operations, the Aller, Leiner, Elbe and Rhine would also be within 28’s operational area, not forgetting the many canals throughout Germany. To carry out this bridging role 28 Amphibious Engineer Regiment has a regimental headquarters that forms it’s own tactical headquarters when the regiment goes to war. The two main users are 23 and 64 Amphibious Engineer Squadrons, supported by 71 Amphibious Engineer Support Squadron and the enormous resources of 28 Amphibious Engineer Regiment Workshop (REME). Each of the two Amphibious Engineer squadrons (fig 2), has two troops, each with twelve operational M2’s, but the regiment maintains a number of M2’s in reserve during peacetime. In war these would be ready for immediate use and would be added to those maintained by the two squadrons, raising the operational numbers to fifteen M2’s per troop. Additional spare rigs are held by 71 Amphibious Engineer Support Squadron (fig 3), who have as one of their components a reserve rig troop with three sections, each holding three M2s. There is also the Amphibious Training Troop. Under normal circumstances the regiment carries out all it’s routine training that deals with the operation and running of the rigs by using this “in house” troop. As with the other amphibious troops in the two squadrons this training troop has the four peacetime amphibious sections that would expand to five in an emergency. The entire Amphibious Training Troop would then become a fully operational amphibious troop. A third component of the Amphibious Engineer Support Squadron is the Amphibious Support Troop. This has three sections, one being the Diving Section that has trained divers on standby to carry out underwater reconnaissance of likely bridging points, and all other missions required by the amphibious unit. There is also a Plant Section with six CET’s (Combat Engineering Tractor) for the preparation of bridge approaches etc, and there are also two LWT’s (Light Wheeled Tractor). The third section is the Resources Section, which has ready to hand, four CSB’s (Combat Support Boat) and their trailers. The entire regiment has the capability to move out of it’s base in Hameln, into carefully selected “hides” close to likely bridging points. There, the amphibious troops would be joined by the REME Forward Repair Teams who would allocate their repair and recovery capabilities to the potential sites and “hides”. Some additional assistance in moving the regiment’s equipment could be expected by the allocation from elsewhere of heavy trucks and tippers for carrying ballast and other materials to improve bridge approach tracks and roads. The amphibious sections with their rigs would be taken to carefully selected positions to await orders. Preparations should have already been made. The Diving Section will have made it’s underwater reconnaissance and the CET’s will have carried out preparation work on both banks of the crossing point. With the help of the Royal Military Police the rigs move in a set order to the bridging site and when ready enter the water. As the sections enter the water they manoeuvre into pre-selected bridge configurations. If the bridge is to be used for heavy tanks they will align themselves side by side and lock together. If only light vehicles are to use the bridge they can space themselves out more and connect by using ramps, fitted into place by on-board cranes. Anchorages are used at each end of the bridge to help the M2 engines maintain the bridge in position during the crossing. Close at hand are the REME Forward Repair Teams. Using mainly Land Rovers they are ready to carry out any immediate repairs but any major repairs will be carried out at Workshop Main. For this reason the REME Teams have two Scammell 35ton tractors with semi-trailers. A broken down M2 cannot be towed and must be recovered on these special semi-trailers. The REME’s involvement with 28 Amphibious Engineer Regiment is huge and is fully integrated into the regiment. (fig 4). The Officer commanding the Workshop has under him a large factory-like workshop devoted to the repair and maintenance of the M2 rigs. In the field the Workshop splits into Workshop Main and three Workshop Platoons, one with each of the amphibious squadrons, and one with the Amphibious Support Squadron. The two squadron platoons each have two amphibious troop forward repair sections while the support squadron has one section for the Amphibious Training Troop. When these platoons operate with the amphibious squadrons they come under their command, but when working with the Workshop Main they come under the command of the REME OC. The M2’s require extensive maintenance and at any one time, a number will be with the manufacturer undergoing a complete rebuild. Repairs and maintenance at Workshop Main can also be quite extensive, involving stressed skin construction using aluminium. The workshop trains it’s own non-ferrous approved welders (including Sappers) and other craftsmen to deal with the various forms of heat-treating specific components. Most of the training for the regiment, is carried out by the Amphibious Training Troop, of 71 Amphibious Engineer Support Squadron. All Sappers who join the regiment to work on M2’s have to go through a 2 ½ week basic course in operation of the rig and waterman ship skills. After that the crewman may have the choice of either water or land duties with the regiment. After four months as a crewman he can take a further four-week course to qualify him as a rig Pilot or rig Driver. M2 rig drivers have to qualify as HGV drivers first. There is also a M2 Commanders course for NCOs and Officers that deals with all aspects of bridge reconnaissance and design.